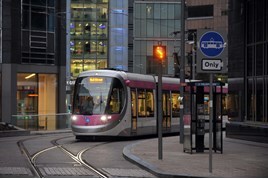 Trams are running on the streets of Birmingham as Midland Metro services began operating in the city centre yesterday (December 6). Trams are serving a new stop in Bull Street, the first step in the opening of the £128 million city centre tram extension. This is the first time trams have run in the city since they were withdrawn in 1953. Building of the Midland Metro extension is being carried out by Centro, the delivery arm of the West Midlands Integrated Transport Authority (ITA). Cllr McNicholas said the extension was just the start of a major expansion of the Metro over the next few years thanks to the regional devolution deal struck with the Government. Once complete the Metro extension will see trams from Wolverhampton continue into the city through Bull Street, Corporation Street and Stephenson Street to terminate at New Street station. Work on the remainder of the city centre extension has been scaled back by Centro for the Christmas period and will resume in the New Year when a completion date will be scheduled. Work has already begun extending the route from New Street Station to Centenary Square with services expected to start running in 2019. The service is operated by National Express West Midlands. And what about extending the Midland Metro Tram Network to Birmingham International Airport and to Merry Hill Shopping Centre (Intu Merry Hill) in Brierley Hill near Dudley and West Bromwich outskirts of Birmingham.